Even very young children can identify an owl, probably due to their forward facing eyes. In spite of that, most owl species are very mystical and elusive. Did you realize that there are around 29 species of owls? In this article I will cover a few of these. Over time I will add more species, so please check back as I work my way through them. I've already written about the Great Horned Own, the Snowy Owl and the Northern Saw Whet. Other's I hope to include in the future are: The Western, Wiskered, Pacific and Eastern Screech-Owls, the Barn Owl, the Flammulated Owl, Spotted Owls, various Pygmy Owls, the Burrowing Owl, the Long-eared Owl and perhaps more. By eating large numbers of rodents and insects owls are helpful to farmers who don't want these pests. It's a win/win situation for the farmer to have an owl on the farm. Did you know this trivia - The Chinese phrase for owl is mao tou ying and is translated “cat-headed hawk”. Some of the body parts all owls have in common are their talons, of course, their beaks wings and enormous forward facing eyes. Some of them have ears that are at different levels (one high and one low) which help them to locate their prey. All owls are meat eaters. Did you realize that owls have 14 neck bones as opposed to our human neck which has only 7 bones in the neck. That may explain why they can turn their heads 280 degrees. I want to thank Scott Manwaring who took the intro photo of the Snowy Owl. You increase your chances of seeing owls if you bird at night, this is known as “owling”. Most species of owls are active at night both hunting and vocalizing. I suggest you go out in a group of at least three birders so that you can triangulate on the owl sounds by splitting up. The less moonlight the better. Talk only in whispers and keep your head lamp out as much as possible. When you do use your light do not shine it directly where you think the bird is. Sneak up as quietly as possible and only turn our light on at the last moment for best results. During nesting season listen for the calls of the babies who are hungry. Did you know that Lakshmi, the Hindu Goddess of prosperity and wisdom, is associated with the Owl. And the peacock represents the Goddess Saraswati who is the goddess of the arts, music and knowledge. The Norse God Odin had 2 ravens as messengers. The Native Americans had the mythic Thunder Bird with great creative powers. The Egyptian Goddess of Truth carries a vulture feather. Here's one of my favorite quotes with great advice. This is a card deck which allows you to get guidance from the animals. These books are also wonderful and cover many more and different animals than Jamie Sams wrote about. Great Horned Owls have what is called a nictitating membrane which can cover the eye vertically to protect this raptors eyes from it’s prey’s teeth or beak and claws when it is hunting. Great Horned owls can live from the Arctic to South America. If you hear crows going crazy they could be mobbing a Great Horned Owl or other raptor, trying to chase it away. I will never forget one Great Horned encounter I experienced near dusk when I was out walking in "my secret garden". I heard a "who" and looked up to see a very large owl land and perch on the top of a telephone pole about 12 feet from me. I froze and watched. In a few minutes I heard another bird "whoing" and then the mate came flying silently over my head. Then they both flew off in the distance. This was such a sacred experience for me personally. I had to sit down for a few minutes and just savor it! Unfortunately, I did not have my camera with me. Biologists often refer to the Great Horned Owl as the “tigers of the forest”. Their bodies are strong enough to carry prey that is three times their own body weight. They have serrated wings which enable them to fly silently and to catch their prey unaware of their approach. Their talons are powerful enough to break the spines of their prey as well. When I participated in a Native American vision quest I was also visited by the Great Horned Owl so this magnificent creature means a lot to me personally. The ability to see in the dark or see the unknown is a quality which was brought to me by the owl. This is a Saw Whet Owl Aren't they cute? 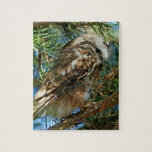 This owl looks a little funny because they lack ear tufts.They are small for owls about 7 or 8 inches. When they are young they are chocolate brown. Look for the white eyebrows. They whistle the same note over and over again too, too, too, too as much as 130 times per minute. They live in forests, conifers and groves. Contrary to what most owls do Snowy Owls do not hide. Their white feathers do camouflage them on the snow, but during breeding season they show up well against the green tundra. In the US Snowy Owls breed only in Barrow, Alaska. One of the reasons they breed in Barrow is the abundance of lemmings there for them to eat. Their beautiful thick plumage insulates them as well as the coat of the arctic fox. They are just fine in temperatures as low as 40 degrees below zero. We do not know how many Snowy Owls there are. A biologist named Denver Holt founded the Owl Research Institute in Montana. He has tracked the Snowy Owl using satellite transmitters. In the winter many of them were found to stay in the Great Plains and in all over Canada. I live in Colorado and in December 2015 a snowy was spotted up North in the Denver area. This was reported on eBird and was confirmed. The bird was on the ground. I’m excited to go up to the place reported on the map and try to see one of these fabulous creatures! I have not personally seen this splendid creature (yet) but hope to sometime. A fellow birder did see it and got the photo below. Update the humans unfortunately scared this bird off. 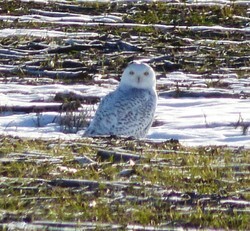 I'm hoping that next year it returns to us, but unlike other birds, Snowies often next in a different place each year. So we will see what this winter coming brings. Snowy Owls were popularized when J.K Rowling chose a Snowy to be Harry Potter’s courier and companion. Do Birds Sleep Like We Do? Well, yes, they do sleep. But a bird must be on guard at all times so they have developed a unique way to sleep. They rest one hemisphere of their brain at a time, keeping one eye open at all times so they can be vigilant to danger. How cleaver. Another thing to know about owl eyes is that they can dilate one eye while contracting the other. This is helpful when adjusting to the light level situation. Have you heard of an owl irruption? This is a mass movement of birds. Boreal, hawk and great grey owls are known to irrupt. But the snowy owls are renowned for their unpredictable irruptions. This event may seem random but it is usually caused by an abundance of voles or lemmings and/or over crowding in years when there is a bumper crop of young ones competing for food. The burrowing owl is just 9 to 10” tall with a wing span of 22” – 24”. In the case of the Burrowing Owls the male is actually larger than the female (in contrast to all other North American owls where the female is the larger of the two). Some people refer to this owl as a “potato on 2 sticks.” The Burrowing Owl lives an average of 8 to 9 years. They live in the grasslands from Canada to Mexico with a few in Florida and some in the Caribbean. It resides in the group Athene where it shares with the pygmy owl and the Northern Hawk Owl. There are actually 25 subspecies of burrowing owls. This group of owls is awake and outside during the day, much like humans. Sometimes their feathers get sun-bleached making them very sandy colored. 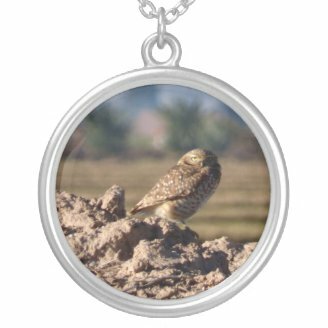 The photo in the necklace shown was taken by me in California near the Salton Sea in 2014. As you can see they live in abandoned prairie dog holes or other vacated rodent or turtle holes. They eat insects and small rodents. Sometimes their chattering sounds similar to a rattlesnake. Wow, what an animal! I saw a barn owl up close and personal a while back on a birding trip. One flew right over my head about 10 feet. Spectacular and BIG it must have been a female! These owls usually live near humans, but for some reason I hadn't ever seen one til last year. They are sometimes called the Common Barn Owl or the Western Barn Owl. They are often killed by traffic and pesticides. They eat small mammals. They have a distinctive heart shaped face which assists them to hear for hunting. The Western Screech Owl is a small owl with short ear tufts which he can erect them or put them down. There is a grey color morph or a brown one. The facial disk is darker than the rest of him. Lives in woodlands, pine and oak forests and mesquites along the West coast from Canada to Mexico. There are actually 8 subspecies of Western Screech Owl. They eat mostly insects, but also small mammals, birds, frogs and reptiles. I was startled by how small it was! I think they are as beautiful at a Great Horned Owl - Great Markings. That varies by type of owl and the location where they are found. 53% eat insects, 32% are carnivorous, some eat aquatic prey such as fish (known as piscivorous), 13% we still don't know what they eat. Hunting behaviors vary according to what prey they eat. One of the ways we learn about owls is by studying owl puke or pellets they regurgitate. Owls have a unique digestive system. 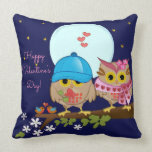 Are you a fan of owls? If so what's your favorite? It's time for owls to build nests and lay their eggs. I have seen only a small number of owls. My best sighting was when I exited my house one evening and a barn owl swooped past me. Roughly the same time there was the hooting of a long eared owl, though I saw it not. One good sighting was early morning on a train through Wales when I spotted a tawny owl hunting in a shady railway cutting.This was a rare sighting of an owl in what is technically daylight. Yes, I can relate. Thanks for your visit and comment. 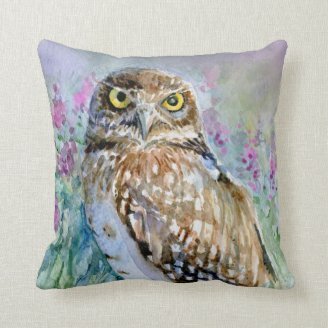 Owls seem to be very popular now. I have a great memory from childhood when I used to love wandering around in the woods and it was safe to do so. One quiet day I looked to my left and at eye level "hidden" in the branches and leaves close to the trunk of a tree was a very large owl...it was looking at me, but remained very very still and quiet. I remember it as being large and brown. It was just one of those moments that stick with you through life. I've always loved the Great Horned Owl too. But there are many others to explore. My favorite is the Great Horned Owl. They are common where I live in the Arizona desert. Informative article, thanks. Probably biology based. Thanks for the visit. Roy Neal is a professional astrologer who posts monthly and quarterly updates for his readers here.